Disclosure: Some of the links below are affiliate links meaning, at no additional cost to you, I will earn a commission if you click through and make a purchase. 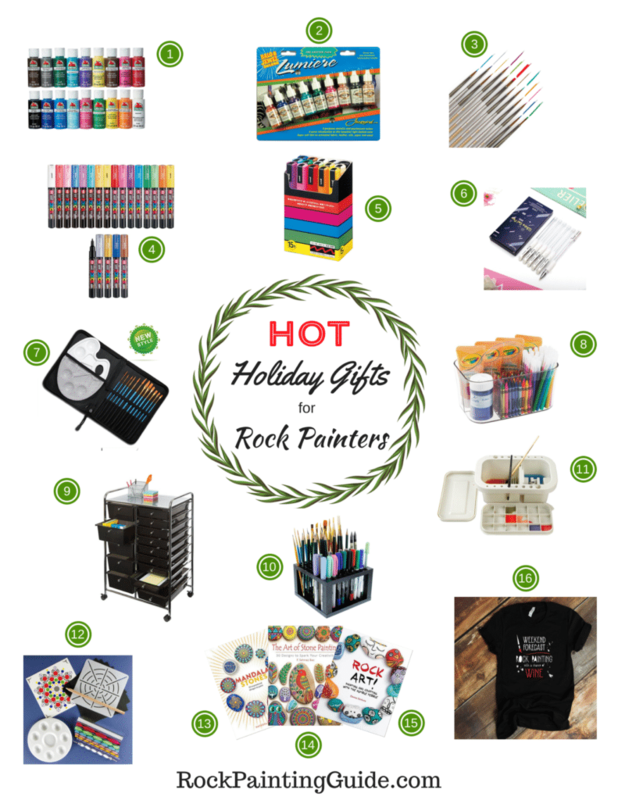 Hot Holiday Gifts for Rock Painting is here! Struggling to find the perfect gift for the artist in your life? These amazing gift ideas for Rock Painters will make your holiday shopping a breeze this year. Choose from over 15 amazing gift ideas for every budget. Enjoy! Jacquard Lumiere – Is a stunning metallic acrylic paint perfect for rock painting. Detail Paint Brush Set – 12 Art brushes for fine detailing and painting. 4.5 Stars and over 200 reviews on Amazon! The ultimate complete set of Uni Posca Paint Markers 29 – 22 Standard and 7 Natural colors. Medium point, water-based ink, fast drying and waterproof, unlike alcohol-based marker ink, this ink does not bleed. Perfect starter sets! Uni-posca Paint Markers 15 Colors – Medium point, water-based ink, fast drying and waterproof, unlike alcohol-based marker ink, this ink does not bleed. Dainayw White Gel Pen Set 0.8mm line for Artists -White gel ink allows for smooth and effortless drawing. This great white gel pen set for artists drawing illustration sketching on rocks. Conda Artist Paint Brush Set – Great gift under $15.00. 12 Brushes, Palette and Carry case with pop-up stand. Art Supplies Organizer Tote – Features 4 various sized compartments and a built-in handle. Seville Classics 15-Drawer Organizer Cart – Pure organization – 15 drawers provide plenty of space for keeping your arts and crafts supplies organized. U.S. Art Supply 96 Hole Plastic Pencil & Brush Holder – The perfect way to keep your art brushes, markers, pens and pencils organized and neat. Multifunction Paint Brush Basin with Brush Holder and Palette – It is an excellent companion for artists, kids crafts, and art classes and decorative painters. Rock Painting Shirt – Wear with pride! Perfect gift for your rock painting friends! We hope you find our holiday rock painting gift guide helpful! For more helpful tips on the best rock painting supplies, visit Art Toolbox Essentials to help you start your rock painting journey today! Got little rock painters, see our Creative Holiday Gift Guide for your little Artist.